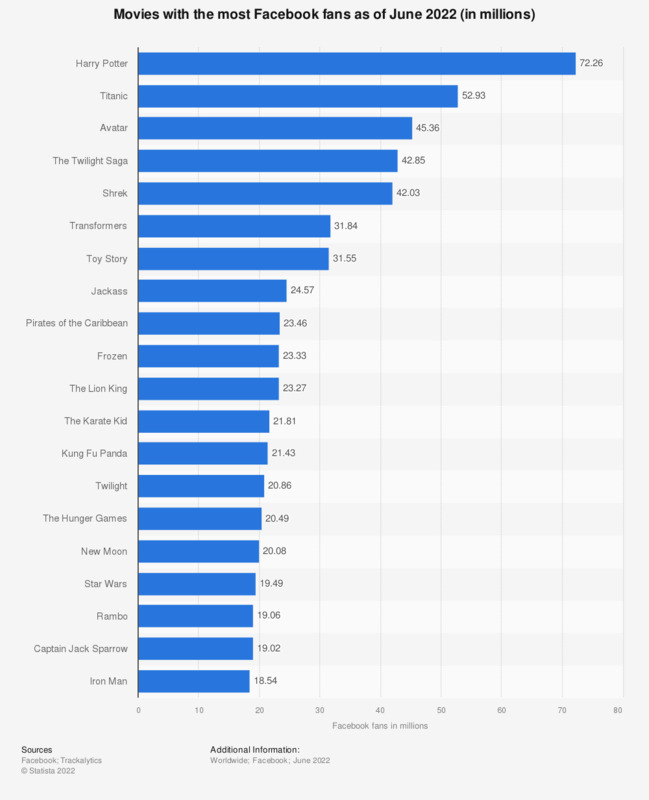 This statistic shows the movies with the most fans on Facebook as of April 2018. The Harry Potter series holds the top spot with 74.06 million Facebook fans, followed by the Fast & Furious series with more than 60 million fans on the social network. Facebook features brand pages for companies to highlight and market their products and services to users. Brand pages usually display the latest products, most popular items and allow discussion and interaction between users. Facebook users can like a product page to become a fan. Facebook movie pages of series such as the Harry Potter movies usually display all of the films whilst highlighting the most recent ones. Others such as the Avatar Facebook page focus on a single movie. The pages usually feature release dates, information on the actors/actresses and production crew, behind-the-scenes information as well as links to trailers and options to purchase official film memorabilia and DVDs or downloads. Film and media consumption and discussion have always been popular online activities. Social media is also a tool to build online buzz regarding upcoming movie releases. Titles were based on official Facebook page titles. Excluding duplicates for series. Everything On "Star Wars" in One Document: Edited and Divided into Handy Chapters. Including Detailed References.